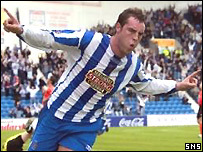 Kilmarnock manager Jim Jefferies admits the club have no option but to consider offers for striker Kris Boyd. Killie are £11m in debt and may have to part with their prize asset, who has a year of his contract to run. "Kris is the same as any player at Kilmarnock and 90% of other clubs, if we get a good offer it would have to be considered," said Jefferies. "But we're not looking to sell him and he says he will be happy to sit down and listen to what we have to say." Boyd has scored 16 times in what has been a disappointing season for the Ayrshire side. Aberdeen have been linked with a move for the 22-year-old but the player would be happier with a move south of the border. "It's no secret that I'm ambitious and I want to go places but I'm happy here at the moment," said Boyd. "Since I broke into the Kilmarnock first team there's been speculation about me, I should have been going here and I should have been going there. "I've said before that I've wanted to play in England but there will be an age and a time that I'll be ready to go. "Towards the end of last season I could have said, 'yes, I'm ready' but I've had a few injuries this season and I've not been that great, I haven't been playing to the standards that I've set. "But I've still got another year after this and I'd like to see who is going to be here next season before I say I'm going to be signing here or I'm going to do this or that. "I haven't been offered anything yet but the manager has said there will be something on the table and we'll look at it once it comes."